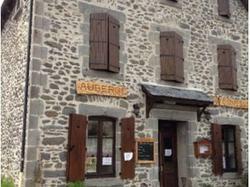 Housed in a renovated farm, Auberge Les Fontilles is located in Coltines and 10 km from the A75 motorway. It offers soundproofed rooms, a garden and free Wi-Fi access. All the heated rooms feature a wardrobe, wooden floors and exposed beams. The private bathroom includes a shower. Some rooms are suitable for guests with reduced mobility. A continental breakfast including homemade bread and jams can be enjoyed every morning at Auberge Les Fontilles. The restaurant serves traditional dishes made of fresh products. This property is 6 km from Neussargues Train Station. A public swimming pool can be found 200 metres away and free private parking is available on site. This room offers free WiFi, a wardrobe and a private bathroom with a shower, a hairdryer and a separate toilet. This room offers free Wi-Fi, a wardrobe and a private bathroom with a shower. This room is more spacious and offers free Wi-Fi, a wardrobe and a private bathroom with a shower.